Explore the Surprisingly Refreshing Maritime Music in Kantai Collection! Kameoka’s involvement in anime has been relatively sparse; she’s more prolific in video games, with orchestrations and arrangements for many well-known titles including Chrono Trigger and Kingdom Hearts, and compositions for visual novels, such as Black Wolves Saga and Ken ga Kimi. 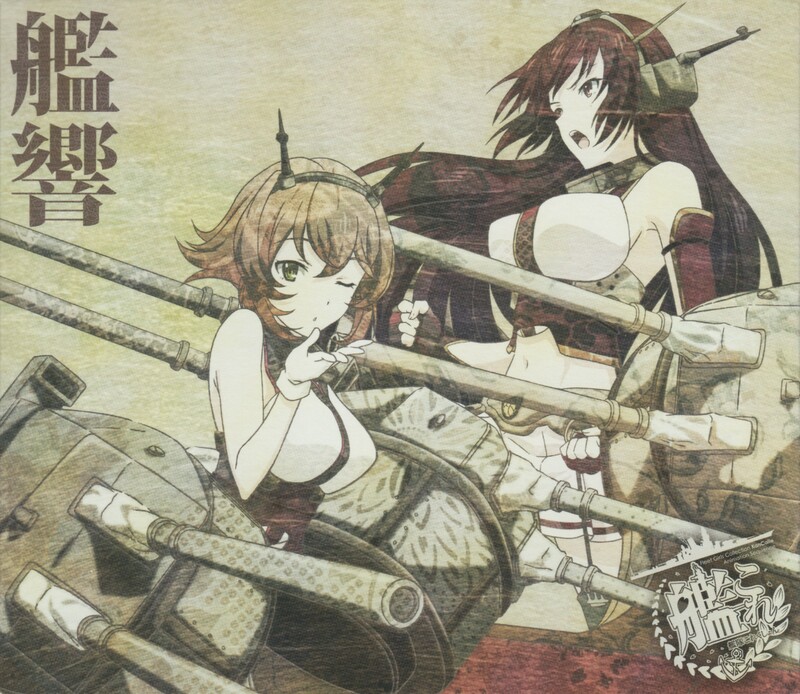 With this extensive experience in tow, Kameoka deftly shapes the world of Kantai Collection with succinct yet vivid writing that is truly a treat to listen to. What I love most about the songs in this soundtrack is how, even with relatively short pieces, Kameoka develops strong melodic lines with varying instrumentation which keeps each track interesting. Plus, as a violinist, much of the music sounds as fun to play as it is to listen to — something that can’t often be said about soundtrack or environmental music. In looking at how the soundtrack is organized, the first disc of the soundtrack primarily contains pleasant pieces, establishing Kantai Collection‘s nautical setting, along with sparser character-centric themes to accompany the slice-of-life elements in the show. It’s in the second disc where you’ll find explosive battle music and dissonant atmospheric pieces used to depict the “unknown enemy.” Across these two discs, the soundtrack’s ability to tell the story stands as a great testament to Kameoka’s creativity (and perhaps the weakness in the lack of plot, but let’s focus on the music here). So as we explore further into the first disc, “Morning Fleet” is a standout. The dotted rhythm of lower strings rock back and forth, evoking a seaside canvas upon which a soaring violin melody floats, later answered by similar woodwind passages. When paired with the opening tracks, “Sea” and “Dawn,” the listener is invited to explore this strange new world, starting with the naval district in which it takes place. While Kantai Collection revolves around naval warfare, that doesn’t preclude the silly slice-of-life antics peppered throughout the series. A traditional shakuhachi flute plays a short, but heartfelt melody atop the waves of the slow, sustained strings. My only qualm is that this calming moment doesn’t last longer, since I enjoy relaxing to mellower pieces such as this. At the end of the first disc, we are shown the “Sortie” theme, reminding us that amidst the pleasantries, the vague Kantai Collection story actually includes battles. Kameoka uses the swung rhythms of sea shanties to reinforce the setting, mixing heroic brass fanfare with sweeping strings in this dramatic call to arms. The piece briefly softens as if to give one last wistful look towards simpler times, but quickly surges forth back into action. Beckoned by “Sortie,” the second disc of the soundtrack shifts gears to bring us into battle! In “Enemy Fleet Sighted,” creeping bass instruments accompany a relentless string cadence to kindle a sinister urgency, before the upper strings burst forth to construct the foundational motif that Kameoka uses in other battle pieces. As the strings take over the melody, the winds weave in to provide the rhythm and together, the ensemble pours in the tension. Let the battles begin! The intensity increases with “Crumbling Battlefront,” where a brisker tempo beckons forth a foreboding motif similar to that of “Enemy Fleet Sighted.” However, the action is more palpable in this piece, as delicious syncopation readily interrupts the steady pulse of the string ostinato and the driving snare drum rhythm. Finally, against the hardships of battle, one remains hopeful for the fruits of victory. Kameoka crafts these uplifting sentiments in the closing song of the soundtrack, “Torpedo Squadron’s Radiance.” The piece opens with a portly string cadence paving the way for a stately horn melody. This enthusiasm builds up as the two sections switch roles, with strings soaring above the orchestra, and even rock drums jumping into the celebration. Throughout all this, Natsumi Kameoka’s masterful command of orchestral instrumentation yields a colorful, evocative soundtrack. Rarely am I able to listen through an anime soundtrack without growing tired of the music style or having to filter out a large part of the staler tracks. While I may not be an avid KanColle player, I may be swayed to start if the game’s music is comparable to the anime’s! Kameoka’s work in Kantai Collection left me clamoring for more, and I look forward to any series she’ll be involved with in the future. I enjoy discovering and sharing musical gems in anime and games, and I tend to categorize soundtrack music for their virtues in both contextual use and stand-alone listening (with a personal bias for the latter). Though my musical roots come from years as an orchestra dork, my day-to-day musical preferences include a mish-mash of many genres, based on what I happen to be in the mood for and some nebulous definition of "sounding good." What a great soundtrack! I’m completely in love!! Thank you thank you thank you! I’m glad you enjoyed it! I think this was my work music for a good week, if not more! It was pretty tough to pick out just a small selection of songs to share in the review, there’s just so much great writing from Kameoka here. The anime soundtrack is quite different from the game music from what I can tell. Mostly the music that stands out is the event boss music in the game and that is more similar to…I dunno, Umineko no Naku koro ni music? Trance music with some really interesting samples and vocalizations in it? Maybe I am just deaf to some of the themes as I have been playing and listening to mostly the same music for well over a year now. Yep, it is indeed quite different! I actually browsed through some of the game music as I was writing the review (http://kancolle.wikia.com/wiki/Music) to see if there were any parallels, but was surprised to find there weren’t any direct references. The game’s music (by different composers) has a fairly different style and feel than the anime, using more electronic and rock/metal vibes for their action (my guess would be due to originally not having the budget to get a full orchestra, thus generally sticking to synth sounds). Many of the tracks I heard also maintain that “imperial Japan” feel with its choice of instrumentation. Kameoka leans much more “Western” in her military references, with “Cafe” probably coming closest to the game’s Eastern flair. I did enjoy the game music though, and the quality of the music for events seems to improve greatly from the original tracks. It was also fun to hear some nods to both Uematsu’s and Sakimoto’s music in several songs.